This is our version of ''steamers''. Add water to large stockpot fitted with a steamer basket to a depth of 1''. Basket should sit at least 3'' above water. Put soft-shell clams in basket, cover, and steam over high heat until shells open, about 10 minutes. Discard unopened clams. Meanwhile, melt butter in a pan over low heat. Pour clear butter into 2 small bowls, discarding milky sediment. Transfer clams to a serving bowl and pour clam broth into 2 small bowls. 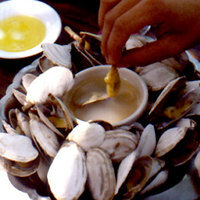 To eat, pull clam out of shell by its siphon, swish in broth to remove any sand, then dip in butter. Drink remaining broth, avoiding sandy sediment.